Logan Kilgore threw for almost 2300 yards this season with 16 touchdowns. NASHVILLE, Tenn. — As one of the program’s most prolific quarterbacks, Logan Kilgore is prominent throughout the Middle Tennessee football record book. Become the first Blue Raiders quarterback to pass for more than 2,000 yards in three straight seasons, check. 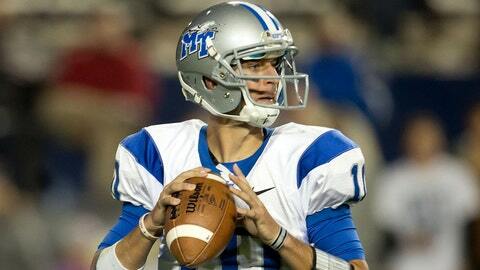 Throw the most passes (1,102) of any MTSU quarterback, check again. Complete the most touchdowns passes (53) in program history, checkmate. But there is one major marker the quarterback and his fellow seniors haven’t checked off their list and that’s winning a bowl game. That opportunity comes Dec. 30 when the Blue Raiders play Navy in the 11th annual Bell Helicopter Armed Forces Bowl in Fort Worth, Texas. "It’s kind of bittersweet," Kilgore said of his MTSU career coming to a close when he makes his 38th overall start in the bowl game. The Blue Raiders return to practice Friday and travel to Fort Worth on Dec. 26. "It has been a great run," he added, "and I have so many great memories. But we all have that motivation to go out on top and having all our hard work and accomplishments pay off by winning a bowl game." Unlike last year when the team went 8-4 in its final season in the Sun Belt Conference but was snubbed for a bowl berth, the Blue Raiders also went 8-4 again this year in their first season in Conference USA. It marked the first time since 1991-92 the program won at least eight games in consecutive seasons. "This team this year is being rewarded for what it accomplished on the field like it should have been last year," Kilgore said after the team went 6-2 in league play to finish tied for second in C-USA’s East Division. "It’s not only different for the whole team," he added, "but especially the senior class that has the chance to have the legacy of winning a bowl game. I am proud for this team and that all our hard work since January is being paid off." After prepping at Carmichael (Calif.) Jesuit High School, Kilgore started his college career at Bakersfield (Calif.) College before transferring to MTSU in 2010. He was thrust into immediate duty as a freshman by starting three games when quarterback Dwight Dasher was suspended, and then he earned the starting job he would never relinquish the following year as a sophomore. During that time, Kilgore has passed for 7,361 career yards, making him one of just four Blue Raiders quarterbacks to surpass 7,000 yards. He is 377 yards shy of becoming the program’s career passing leader, trailing only the 8,007 yards thrown by Wes Counts from 1998-2001. "You can’t put a price or value on how important that is," Blue Raiders coach Rick Stockstill said of Kilgore’s experience not only as leader of the offense, but the team as well. "Logan is a fifth-year senior and has been through a lot of games. He’s been through a lot of close games. He’s been through wins and losses. "It’s just the steadiness that brings to our offensive team, the confidence that he brings individually that, ‘Hey, I have made this last-second throw for a touchdown pass’ or ‘I’ve driven the team down in the last minute of the game to win.’ He never panicked. We never panicked as coaches." Among the attributes of the 6-foot-3, 201-pound Kilgore is his arm strength, which garnered national attention with a spot on the Manning Award watch list as one of the nation’s top quarterbacks. This season, he was slowed by an early injury to his throwing shoulder, but finished strong down the stretch, including passing for 325 yards to close the regular season in a 48-17 win over UTEP. "Logan’s arm strength is a big part of his game," Blue Raiders offensive coordinator Buster Faulkner said. "He can zip the ball into a lot of windows that other guys can’t. He has a lot of confidence in making a lot of throws. "In fact, there isn’t a throw he can’t make. We try to call plays off his skill sets. He can put a lot of passes in a lot of places." After passing for 2,231 yards and 18 touchdowns as a sophomore, he came back last year to throw for 2,571 yards and 16 scores. This season, he has completed 197 of 322 passes (61.2 percent) for 2,289 yards with 16 touchdowns and 11 interceptions. His favorite targets have been senior wide receiver Tavarres Jefferson (41 catches for 532 yards and five touchdowns) and junior wide receiver Marcus Henry (36-528-3). While the Blue Raiders run out of a spread offense, they very much present a balanced attack with an emphasis on the run. This season, the team has rushed for 2,500 yards and passed for 2,489 yards. Four running backs have gained at least 225 rushing yards, led by sophomore Jordan Parker (741 yards) and junior Reggie Whatley (631). But both have been slowed by injury, opening the way for sophomore Jeremiah Bryson to rush for 125 yards in the season finale. "It’s extremely important for any team to have a sense of balance and the ability to run the ball," Kilgore said. "We have five guys who can carry the ball with success at any moment. All of them have different skill sets. "And the play of our offensive line has helped us achieve great balance. I think it is a goal for any team to have that kind of offensive balance." Indeed, that is how Faulkner envisions the offense. In his third year as offensive coordinator, he has been seen Kilgore’s growth three seasons as the starter. "We are a spread offense," Faulkner said, "but we see ourselves as having a downhill running attack. We want to be a physical football team, which always helps the passing game. "The last five games, we have run the ball better, which on the flipside has helped us to throw the ball better." Indeed, the Blue Raiders have been on a roll down the stretch. Their five-game winning streak to close the season started on Oct. 24 with a nationally televised 51-49 home win over Marshall. It was the only league loss for the eventual East Division champion, which lost to Rice in the C-USA title game. That late Blue Raiders run delivered the program’s fourth bowl appearance in Stockstill’s eight seasons as head coach. In their most recent bowl appearance, the Blue Raiders lost to Miami (Ohio) in the GoDaddy.com Bowl in 2010, Kilgore’s freshman season. "Logan had a great (senior) year and a great career here," Stockstill said. "I just hope he can go out and play the best game he has ever played in this bowl game. He is a special young man. "He loves this school. He loves this game. I’m just really proud and happy for him." While the bowl game against Navy (7-4), which plays its regular-season finale Saturday against Army, might be the last game of his college career, Kilgore doesn’t feel he has played his last football game. "I think about it all the time," Kilgore said of playing in the NFL. "It has been a goal of mine since I was little. I am excited to figure out all the details, see where I’ll be training, and explore that next facet of my life. "I think there is a future for me. I don’t think this is my last football game. I look forward to seeing where I might fit and what I can do."